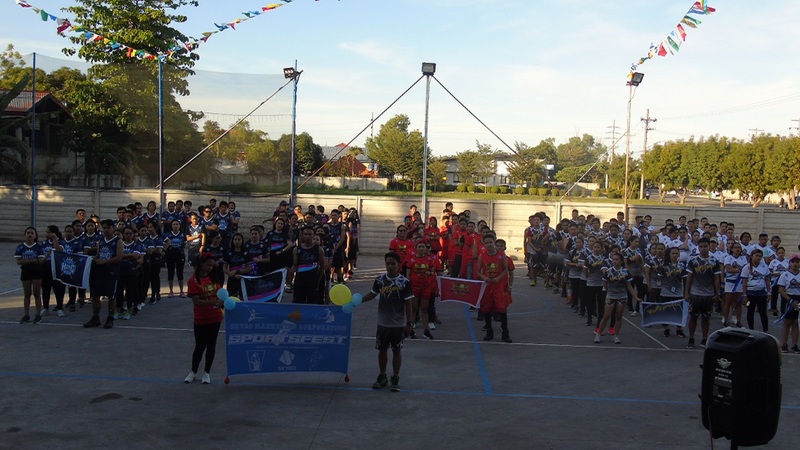 It was followed by the Oath of Sportsmanship by Mr. Reginaldo R. Patatag Jr., with all participants pledging to play fairly and be obedient to the rules. Next was torch lighting which was led by Mr. Joseph V. Indig, IT Programer passed on toMs.Avelyn C. Saladas, Treasury Manager, then to Ms.Juris T. Hingco, Finance Manager, then to Ms. Irene A. Padin, Executive Assistant to CFO, then to Mr. George Alidon, Parts Warehouseman and lastly to Mr. Raulito C. Domino, Communication Manager. The game reminders and house rules for all the sports games in the coming weeks including Basketball, Volleyball, Darts, Chess, Table Tennis, and Badminton were stated by Mr. John Troy Babatid, General Admin Supervisor. Before the main competition, the Prince and Muses from each team are ready for the banner raising, and the first team who raised their banner was the Indestructible Prince by Mr. Steve Canedo (Prince) and Ms. Lovelyn Ann Cogollodo (Muse). The 2-hour event highlighted the 5 teams vying for the winning title for the Cheer dance competition. The teams were named Invincible King, Incredible Knight, Indestructible Prince, Lightning Wizard and Mighty Archer respectively. The Cheer Dance Competition is where the teams reveal their hidden talents that will showcase the team`s creativity at the same time to improve camaraderie and coordination with a friendly competition. The 5-minute demonstration was judged by Mr. Goodie Cayacap, Operation Assistant / PCO, Mr. Brian Yorong, Comrel Officer and Ms. Kimberly R. Yamson, Sales Assitant in NASI. After enjoying the presentations and pictorials, everyone had a packed dinner and went on with the Pinoy Olympic Games. Each team had 10 representatives for each game and appreciated the event even more as all players and even the audience had an amusing time watching their colleagues play team-building games and these were Pingpong, Ice Water and Balloon Relay. These events definitely created a spirit of camaraderie as the games pushed every member to be competitive and be a good sport at the same time in the process. The sportsfest has been launched and so is everyone in the venue, ready with their game face on for the SKYGO Sportsfest 2019.